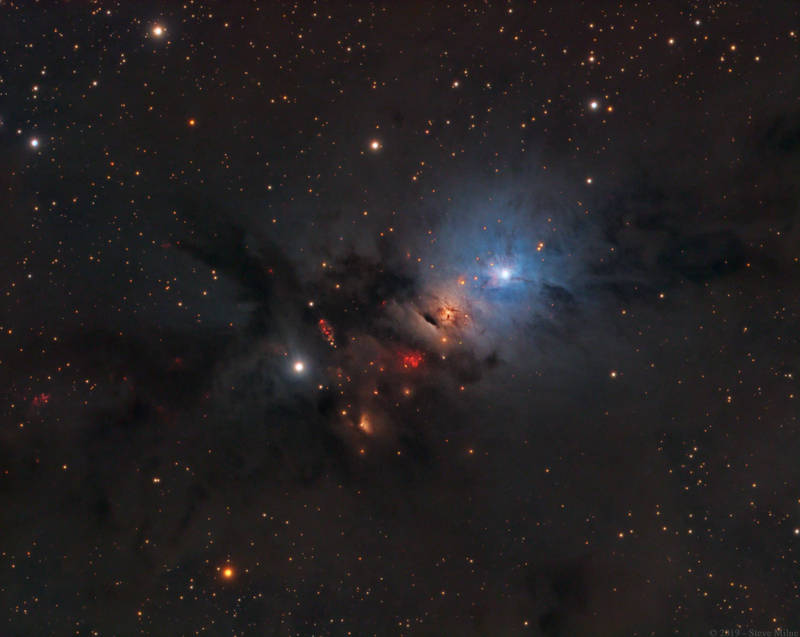 Explanation: NGC 1333 is seen in visible light as a reflection nebula, dominated by bluish hues characteristic of starlight reflected by interstellar dust. A mere 1,000 light-years distant toward the heroic constellation Perseus, it lies at the edge of a large, star-forming molecular cloud. This striking close-up spans about two full moons on the sky or just over 15 light-years at the estimated distance of NGC 1333. It shows details of the dusty region along with telltale hints of contrasty red emission from Herbig-Haro objects, jets and shocked glowing gas emanating from recently formed stars. In fact, NGC 1333 contains hundreds of stars less than a million years old, most still hidden from optical telescopes by the pervasive stardust. The chaotic environment may be similar to one in which our own Sun formed over 4.5 billion years ago.